Based on Turkish evidence and its own assessment, Langley concluded with high confidence that MBS bears full responsibility for ordering Khashoggi’s murder. Yet Trump and regime hardliners remain in coverup and denial mode about an indisputable fact. It’s significant that the CIA refuted the White House and Riyadh in its conclusion about Khashoggi’s murder. It’s a major development, indicating Langley’s displeasure with MBS rule and Trump’s support for a figure it opposes. DLT was fully briefed on the agency’s assessment. Haspel above all other regime officials is in a position to provide intelligence information to Congress about what happened. Senate Foreign Relations Committee chairman Bob Corker called for her to appear before committee members with Pompeo and Mattis on Wednesday. According to an unnamed US official, she was told by the White House not to testify, adding “(t)here is always an intel” official present during briefings like Wednesday’s. 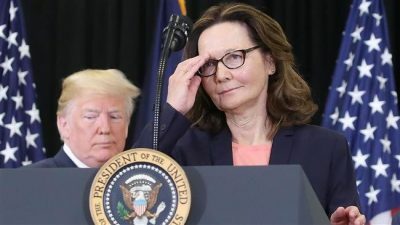 Haspel’s absence today speaks for itself, despite John Bolton claiming no White House order for her to stay away from the Senate hearing. A March Senate measure, under the 1973 War Powers Resolution, to suspend arms sales to the kingdom for Yemen war high crimes was defeated by majority Senate members. An upcoming measure, perhaps to be voted on this week, could pass. Congressional approval for suspending arms sales to the kingdom requires at least a veto-proof two-thirds majority. Even if enacted into law during the lame duck session or by the new Congress next year, it’ll be short-term policy before resuming dirty business as usual with the kingdom. Trump and regime hardliners remain in coverup and denial mode. Earlier this week, DLT again turned truth on its head, claiming “the CIA did not say affirmatively” that MBS ordered Khashoggi’s murder. An unnamed former State Department official minced no words, saying MBS’ direct responsibility for Khashoggi’s murder is “blindingly obvious” to virtually everyone in the international community. Trump, regime hardliners, and Saudi MBS loyalists alone dispute what’s indisputably clear. The 15-member hit team dispatched to Istanbul included Saudis close to the crown prince, including members of his personal security detail. The order to kill Khashoggi came from the kingdom’s highest authority – its de facto ruler Mohammad bin Salman, no one else. Endless Trump regime coverup and denial won’t change what’s “blindingly obvious” to everyone paying attention.